This week, I’m delighted to welcome an illustrious trio of guest bloggers – my friends and colleagues in the field of Restoration naval history, Frank Fox, Peter Le Fevre and Richard Endsor. Frank, the author of The Four Days Battle of 1666 and Great Ships: The Battlefleet of King Charles II, recently posted here about important new evidence regarding the ship lists of the Battle of Beachy Head, 1690. Dr Peter Le Fevre, the co-editor of Precursors of Nelson and British Admirals of the Eighteenth Century: the Contemporaries of Nelson, has been working for well over three decades on the Battle of Beachy Head and the controversial British commander in the battle, Arthur Herbert, Earl of Torrington. Richard Endsor is the author of The Restoration Warship, and the acknowledged authority on late Stuart naval shipbuilding. In this post, they examine the identity of the important shipwreck known as ‘the Normans Bay wreck’. Gentlemen, the floor is yours! *** Many thanks to J D Davies for making his site available. In 2005 divers freeing a lobster pot discovered a wreck about a mile offshore at Normans Bay near Pevensey on the coast of the English Channel. At first it was thought to be the English warship Resolution which drove ashore in the Great Storm of 1703. 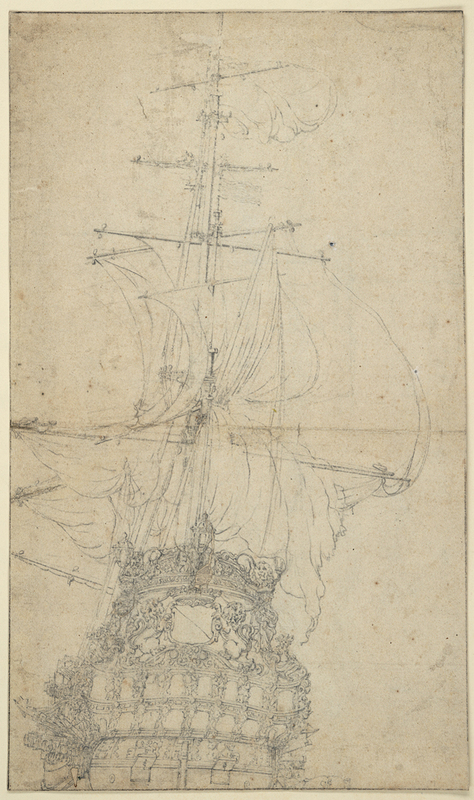 But the Resolution ended up close to the beach (the crew got ashore safely despite heavy surf), and gun-founder Major John Fuller recovered many guns from the wreck – 40 by May 1705 [thanks to ordnance historian Charles Trollope for this, citing the National Archives of England and Wales (NA), WO 51/70, Ordnance Office bill book, fo.10]. Archaeologists, however, have charted 43 guns at the Normans Bay site (as of 2007) with others undoubtedly buried, which makes too many for the 70-gun Resolution [Wessex Archaeology, Norman’s Bay Wreck, East Sussex, Designated Site Assessment, Archaeological Report (Salisbury, November 2007, Ref. 53111.03zz), p. 12 and fig. 2]. Also, tree-ring analysis has shown that the frames were German oak cut after 1658 [Nigel Nayling, The Norman’s Bay Wreck, East Sussex, Tree-Ring Analysis of Ship Timbers, English Heritage Research Department Report Series 25-2008]. This suggests that the ship was Dutch, perhaps one of men-of-war lost after the Battle of Beachy Head in 1690. Unfortunately, modern English-language sources give few details of these vessels and their misfortunes. We have sought to remedy this deficit using British, French, and Dutch printed primary sources, and British manuscript sources. The results offer a plausible candidate for the identity of the Normans Bay wreck. This accounting of Dutch losses shows that of the seven large men-of-war destroyed, the Friesland, Noord Holland, and Gekroonde Burg sank or burned many miles from land. Three others ran ashore and were burned at or near Hastings. The identity of these, already established above, are confirmed by travel passes to the Netherlands issued by the English government during mid-July to the captains and officers of the Maagd van Enkhuizen, Tholen, and Elswout [NA, SP 44/339, Warrants, pp. 307, 314, and 316]. The remaining major warship, the Wapen van Utrecht, thus becomes the only possibility for the Normans Bay wreck among the Dutch losses of this battle. And indeed, Gillis Schey reported that the abandoned vessel went down ‘along the English coast’. This indicates that she sank near land, but is hardly conclusive in that the description covers many miles of shoreline. Another source, however, focuses rather more narrowly on her resting place. On 30 August 1690, Queen Mary promulgated a warrant which began, ‘Whereas 3 Ships of Warr belonging to the States Generall of the United Provinces were burnt neare Hastings, & a 4th was sunk neare the Haven of Pemsey [Pevensey] after the late engagement with ye French Fleet’. The document enjoined her ‘Loving Subjects’ to assist in every way the persons appointed by the Dutch ambassador to ‘fish up’ the guns and equipment of these ships [NA SP 44/339, Warrants, pp. 368-369]. It hardly needs saying that ‘near Pevensey’ accurately describes Normans Bay. Also worth noting is that the Wapen van Utrecht, built 1665, is an excellent fit for the tree-ring dating. The best way to obtain more decisive evidence is to raise some of the guns and remove the concretions to reveal the underlying inscriptions. In 1666 the Wapen van Utrecht had six brass 24-pounders, eighteen iron 18-pounders, six brass 12-pounders, sixteen iron 8-pounders, sixteen iron 3-pounders, and four brass ‘draakjes’ (small shrapnel guns) [H A Van Foreest and R E J Weber, De Vierdaagse Zeeslag 11-14 Juni 1666, Amsterdam 1984, p. 197]. 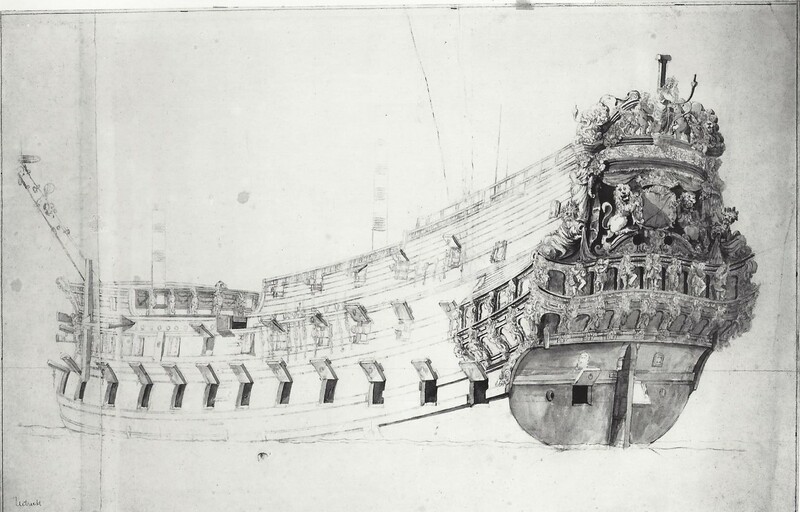 By 1690 the armament of this veteran warship – Beachy Head was her seventh major battle – undoubtedly differed. 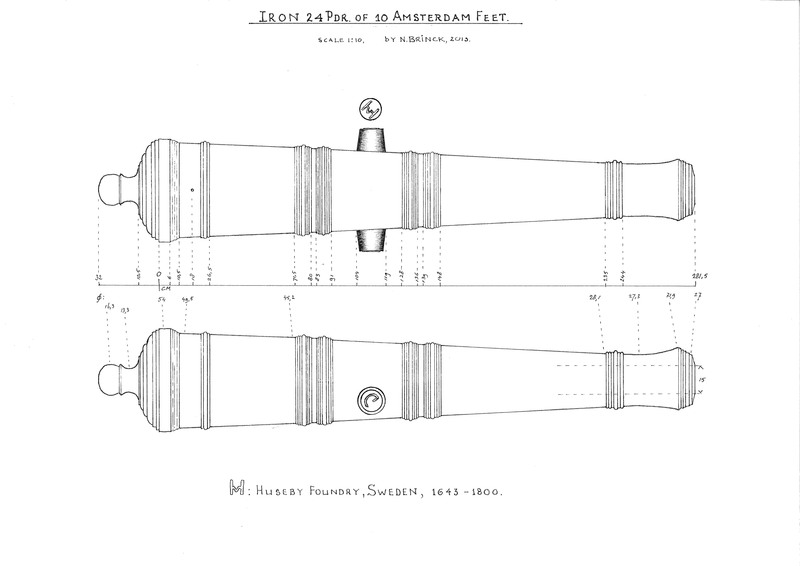 Dutch ordnance historian Nico Brinck [personal communication] suggests that the final outfit was probably all iron, and the little 3-pounders originally on the forecastle and quarterdeck would have been replaced by a larger calibre, perhaps 6-pounders. He also notes that iron guns supplied for the Dutch fleet in this period usually came from the great De Geers foundry in Finspong, Sweden, less commonly from Huseby also in Sweden, and sometimes from German sources. 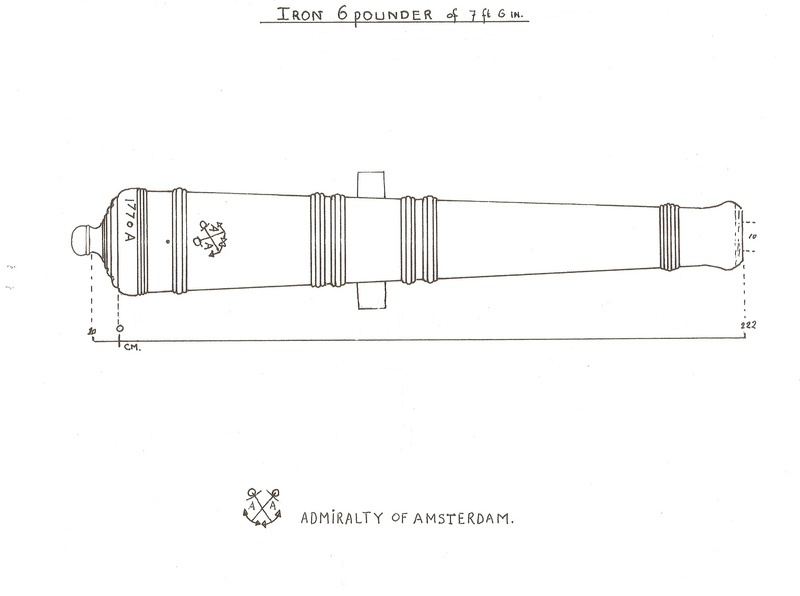 Guns often had a founder’s mark on the trunnions (‘F’ for Finspong, for instance), and if they were aboard the Wapen van Utrecht, most would show the crossed anchors and double ‘A’s of the Admiralty of Amsterdam on the first reinforce just forward of the touch-hole. Even if the Normans Bay wreck turns out not to be the Wapen van Utrecht, this blog has at least added detail to what has been known of the Battle of Beachy Head. Great article, I have dived and photographed this wreck site, it would be great to finally discover its true identity, fantastic piece of research. Fantastic article – I loved it!